I know this sounds too good to be true, but the combination of bananas and eggs is some kind of magic that I’ll never understand! But the real beauty of this recipe is that it only takes a few minutes, and satisfies a sweet craving without all of the guilt. It’s flour-less, gluten free, and super moist and delicious! You can also bake this in the oven for 10-15 minutes at 350 degrees fahrenheit. Add a dollop of peanut or almond butter to the top of the cake for extra richness. 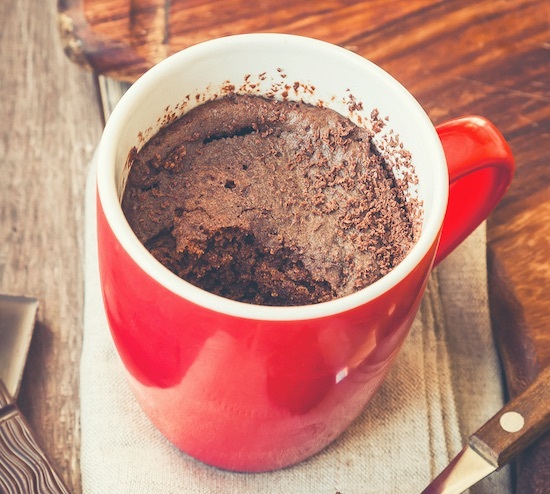 This mug cake is not very sweet if you’re used to eating refined sugar. Feel free to add a tbsp of honey or maple syrup if your diet allows it. Chocolate chips are also a good way to sweeten it up a bit!